The number four seems to have weight in the newly reorganised four-member group. Carrying on from Fate Number For, which was released on 4th April 2017, Our Twenty For was also released on 4th August 2017. Our Twenty For is also their fourth album since their debut. Putting together the puns and the specific choice of dates, the play with numbers appear far too elaborate to be a coincidence. We even get a total of four new songs if we include the previous release. Perhaps an attempt to concentrate the spotlight on the present four members of the group, perhaps a prizing of the current Winner over their debut selves, four is clearly a golden number for the group. Riding along the waves of summer, Winner is running with the tropical tropes of the season with their comeback. “Island” is an easy exemplification of this familiar sunny image. The title itself brings to mind palm trees, sand and sea, shorts and singlets – we see all of this in the MV. The boys are having fun at the beach, the colours are vibrant and eye-catching, the mood is uplifting like a good summer vacation with great company. Rather than fall into a melancholy like in “Fool,” this song utilises familiar house synth and brass leads without sounding too cluttered. Winner is inviting in “Island” and we get to see playful moments between the boys. One of my favourite moments in the MV includes Winner teasing the audience with an approaching kiss between Seungyoon and a girl that cuts to smirking Mino and Seunghoon holding hands. On the other hand, Winner presents “Love Me Love Me” which approaches the sensibilities of “Really Really.” Though less frivolous and energetic than “Island,” “Love Me Love Me” is not exactly heavy-hearted. More of a muted disco tune that listeners can bop their heads to without feeling exhausted, “Love Me Love Me” is an appeal to be loved back. The MV for “Love Me Love Me” is equally light-hearted, with Winner carrying through in going tropical. The colours for “Love Me Love Me” are less striking, going ahead with a pastel and softer aesthetic instead. The sun is not piercing and Winner isn’t exactly at the beach. However, we still get the sense of summer with the outdoors landscape of backyards, open lots and sports field bleachers. We are offered with beautiful snapshots of Winner enjoying leisurely activities as though they are in a photoshoot. Complementing such a background are occasional text message conversations overlaid on everyday items. This shimmering between connection and disconnection creates a whole new atmosphere that is not entirely intrusive or overly imposing. Balancing the eagerness of the lyrics with the softness of the MV aesthetics, we are drawn in by the pleasantness of the images without it being too distant or unrealistic. The images are neighbourly and familiar, replicable even. It makes one want to head out and enjoy the good weather before it ends. Between “Island” and “Love Me Love Me,” Winner presents us with two imaginations of summer – both of which are equally appealing. Summer does conjure thoughts of the blazing sun, heading to the beach for a relaxing dip in the waters, and campfires at night. However, summer can also be cooling and refreshing in a pleasing way. Shying away from the blinding rays of sunlight, we also have more comfortable images of the neighbourhood. The character of Winner’s music has clearly shifted since their debut album. Their newer tunes seem to veer towards clear flush synth beats, are slightly less musing and more brisk in the emotions. We see a slight residue of their debut tone in “Fool,” but very less of it in “Island” or “Love Me Love Me.” Adopting a trendier music style with these newer tracks, it suits the summer mood and brings a coolness to listeners, though I do miss the quieter beauty and sensibilities of their older melodies. “Island” and “Love Me Love Me” are great to chill-out to with friends, not being too overwhelming or too emotionally driven. However, they do seem to lack a punch. Sweeping back into the scene with a comeback after a short four months, Winner’s Our Twenty For might be too quick for something concrete. Winner might have moved away from their usual melancholic sound, which is great because they are willing to try something novel, but these two songs seem to be built on rather shaky foundations at the moment. Admittedly, it might be too soon for us to judge which direction Winner is headed towards. Only with four new tracks since losing a member, the boys might still be trying to form a new voice of their own through their music. It is easy to criticise these new tracks as trying to be trendy or lacking in lyrical depth, but I have held myself back from doing it because Winner is made up of talented composers who have previously proved themselves capable. What we know Winner is able to achieve in terms of variety of genres and flavours has yet to push itself through in this comeback. 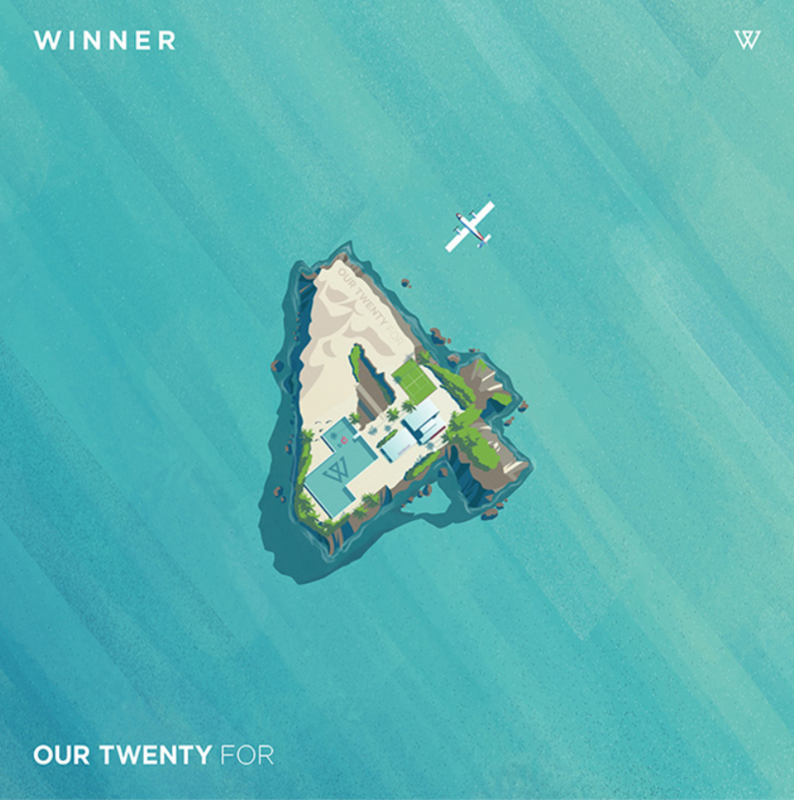 A quick return to the album’s title, Our Twenty For, it can be read as referring to the four members in their twenties, or simply as “our twenty-four”. But I would rather see it as Winner themselves trying to answer the question of what exactly are their/our twenties for? The twenties are for heading out and mindlessly having fun, especially in the summer, as demonstrated in these new tracks. Yet, Winner’s slow embarking as a four-member group offers another reply for listeners who are unsure of their new sound: it is a journey of figuring out paths to take, as well as finding a personal voice for themselves as a group and musicians.